Pat Forde, of Yahoo Sports, wrote an article last week about Ole Miss using Barney Farrar as a scapegoat, and, in that article, he interviewed Houston based attorney Bruse Loyd. Forde highlighted what has happened to Farrar since his dismissal from Ole Miss back in December of 2016. 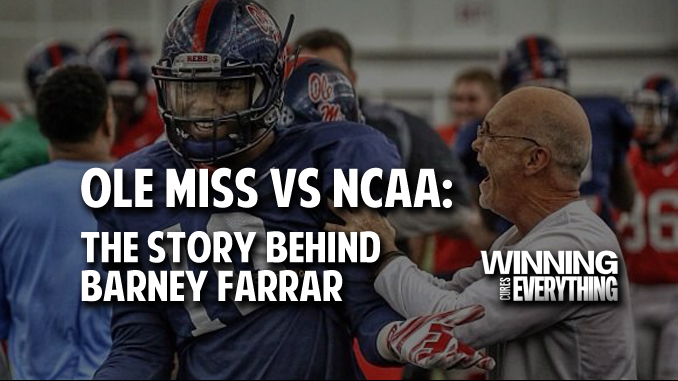 Forde’s article is what really got me into the topic, but before we dive into the mess that Ole Miss is causing itself, let’s first look at Farrar and where he came from. Barney Farrar, from Kossuth, MS just outside Corinth, played at NEMSCC and went on to play at Delta State for Red Parker. Parker was from AR and out of the Larry Lacewell / Barry Switzer tree. Parker was the head coach at the Citadel for 7 years in the late 60’s and early 70’s and was the head coach at Clemson from 73 through 76. His assistant head coach at Clemson was one Charlie Pell. Pell replaced him for the 77 season and Parker went back to coaching high school ball in Arkansas. He coached Southern Arkansas for one year before moving to Delta State in Cleveland, MS in 1982. There, he was brought into contact with Billy Brewer and the plantation. Ole Miss used Delta State about the same way Auburn used Jacksonville and Troy when Dye was there. Barney played for Parker at Delta State, was a GA for a year or two and went to Clemson where he worked for Danny Ford after Ford replaced Pell. He stayed when Ken Hatfield came after Clemson went on probation and Hatfield was run out of Arkansas. Barney stayed with Hatfield for the next 15 years, following him to Rice where he was an on the field assistant until 2005 when Hatfield was mercifully fired. He found his way back home as an assistant AD on Ed Orgeron’s staff at Ole Miss and where he came in contact with David Saunders and Hugh Freeze. What connection brought him back home? His old coach at Delta State, Red Parker became Billy Brewer’s QB coach and offensive coordinator in 1988 and stayed until 1991, the time period when the Network activities took place that put Ole Miss on probation in 1994. He got to know the Network very well and I suspect he worked the booster network to get Barney a job close to home when Hatfield and staff were let go. Barney left Ole Miss and joined Larry Fedora’s staff at Southern Mississippi in 2008 as the tight ends coach when Nutt came to Oxford. He fought and defeated cancer and moved to an AD spot before coming back to Ole Miss in the same role when Fedora left for North Carolina and Freeze took over at Ole Miss. To make matters more interesting, Farrar’s lawyer, Brewster Loyd, is from Corinth, MS, played at NEMSCC with Barney and played at Rice before Barney got there. After his playing days, his law office was established in Houston. He would have been a letterman and an alumnus while Hatfield and Barney were there. Also on that same NEMSCC football team was a guy named Mark Keenum—–look him up. You’ll laugh. For those that don’t want to do the digging, Mark Keenum is the President of Mississippi State University and, in June of 2016, was elected President of the Southeastern Conference. He’s got nothing to do with this… it’s mostly just to look at how people can be connected without anyone ever really knowing. Anyway, back to Farrar and the mess at Ole Miss. Farrar was the coach in the Laremy Tunsil text messages that came out on draft night. Rumors came out of Oxford that Hugh Freeze asked him to resign, to help save face and show they were being compliant. He declined and stayed on at the school through the football season. Farrar was then placed on administrative leave in November 2016, and was terminated in December. Ironically, they announced it in just one sentence at the bottom of a press release announcing they were cutting ties with offensive coordinator Dan Werner, and only stated that they were not renewing Farrar’s contract. The school agreed to pay him through March. In March, they stopped paying for his legal defense as well. Loyd said he’s had access to the other response briefs from Ole Miss. After reviewing them, he believes that Farrar is bearing a disproportionate amount of responsibility. “It’s not right,” Loyd added. “It is a betrayal of him. Do I think Barney’s been made a scapegoat? Yes. Based on what I’ve seen and know, they set him up. ‘You are the most unsophisticated, the most expendable, and, tag, you’re it.’ But I have to say, I’m his advocate in this. Loyd would not comment specifically on Farrar’s defense but said the brief he filed addresses the question of whether the actions that led to alleged violations were of Farrar’s own initiative. Loyd says compensation was stopped for his client far too early. If Farrar was not the “lone rogue actor” in this, who else was it? In the Yahoo Sports article, Loyd stated that “Barney was being portrayed as the lone, rogue actor” and “Barney’s thinking is, ‘We were all in this together – what happened to me?’ They were a team…” which leads me to believe that Barney was taking orders from somebody. He did what he had been told to do, and was being hung out to dry because of the Tunsil situation, which, to be clear, there was nothing listed about the Tunsil draft night incident in the latest NOA from the NCAA. So that event is not what the NCAA is pinpointing. Ole Miss is trying to distract attention from the real issues with this one. Who exactly does Farrar & Loyd have an issue with if it’s not Ole Miss or Hugh Freeze? Ok. Here’s where you have to read between the lines. The school cut ties with Farrar because of the NCAA violations, one would assume. It didn’t state that in the December release – they just said they were not renewing his contract. That’s what Ole Miss has to do in a situation like this. If you have proven rule violators on your staff, you have to cut ties with them, unless you can prove their innocence. They weren’t interested in proving Barney’s innocence – they were looking for a scapegoat. Farrar understands that. The reason all of this has been made public is because Farrar is not being taken care of by The Network, which is the title that’s been given to the circle of Ole Miss boosters that are behind all of these violations. So why come out and publicly air grievances that you’re not being taken care of? Loyd stated in the Daily Journal article “We have no issue with the school, we have no issue with coach (Hugh) Freeze. We have no issues with anyone but the persons who have abandoned Barney.” The reason all of this has been made public is because Farrar is not being taken care of by The Network, which is the title that’s been given to the circle of Ole Miss boosters that are behind all of these violations. That’s rule #1 when trying to cover up cheating. And it should be common sense. Ole Miss’s booster network clearly does not understand that. Here’s what should have been done – Barney should have been taken care of under the table, and in cash, so that he wouldn’t talk about any of this publicly. Pay him enough so he doesn’t mind being the scapegoat so Ole Miss can skate by with as few penalties as possible. Farrar is being left out to dry here, and , if you’re cheating, you don’t want to leave anyone feeling like they’re not being taken care of, or they’ll start squealing. He is not obligated to talk to the NCAA right now because he’s not an NCAA employee… but if he feels betrayed, there’s nothing stopping him from spilling every bit of information he has on the program and taking them down with him. I’ll be curious to see Ole Miss’s response to the NOA, which they said will be released publicly the week of June 5th. Anybody want to take any wagers on that response coming out on Friday at 4:45pm so they can try and miss the news cycle?